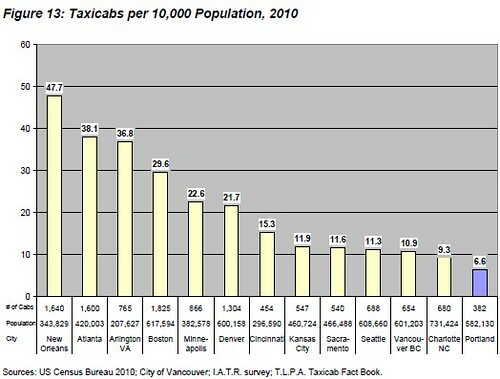 Does Portland Need More Taxis? Apparently so, according to a staff report (PDF, 151K) prepared for the Private for-Hire Transportation Board and City Council. It’s fall, which means that Metro is seeking citizen applicants to serve on the Transportation Policy Advisory Committee. There are four openings. TPAC is an advisory committee that reviews regional plans and federally funded transportation projects across the three-county Portland area. It advises local and regional leaders on transportation spending priorities as well as policies related to transportation, such as efforts to curb greenhouse gas emissions and create communities with easy access to public transit. It also recommends needs and opportunities for involving the public in transportation matters. An essential responsibility of TPAC is to advise the Joint Policy Advisory Committee on Transportation, JPACT, a panel of elected officials and transportation agency executives that controls federal transportation spending in the Portland area. TPAC also advises the Metro Council, which reviews and must approve all major JPACT actions. Would You Like Some Car Sharing with Your Transit? Maybe we’ll now have to rename it the mobility appliance, but you can now show the nearest car2go vehicles on your transit appliance. If you’d like to add this to your configuration, get in touch! Now when are we getting bike sharing, and will it have a web service? Disclaimer: Zef Wagner is currently a Service Planning and Scheduling Intern at TriMet. The views expressed on this website are his own and do not necessarily reflect the views, plans, or policies of TriMet. On this opening week of the new Portland Streetcar Central Loop comes news from Seattle, where their South Lake Union Streetcar just announced an agreement with Amazon worth an astonishing $5.5 million over 10 years in capital and operating assistance. Amazon, already a major employer occupying several buildings in the newly-developed South Lake Union neighborhood north of downtown Seattle, is planning to build 3 new skyscraper office buildings in the area to expand their operations. This massive investment in land use (on lots occupied by surface parking lots for the last several decades) is matched by a massive investment in transportation. In addition to sidewalk and bike improvements in the area, Amazon has agreed to buy an additional streetcar vehicle and pay for operating expenses to allow for 10-minute all-day frequency, up from a paltry 15-minute frequency today. For those unfamiliar, Seattle Streetcar is very similar to Portland Streetcar, which makes sense since they used our line as a model. They use the same vehicles, both run mostly in mixed traffic, both go very slowly over short distances, and both have been controversial due to concerns about bike safety and cost efficiency. More importantly, both have been used as an explicit way to encourage development. In the case of Portland, the streetcar is often touted as being the main investment that brought about the Pearl District. In Seattle, the streetcar was sold as a way to stimulate development in South Lake Union. While I am skeptical that the Pearl would not have developed without the streetcar (considering the whole area is within easy walking distance of downtown and the transit mall), in the case of Seattle I am more convinced that it had a role. Most of the development in South Lake Union has taken the form of major employment like the Amazon campus, the Fred Hutch cancer center, and a plethora of biotech companies. There has been some mixed-use development as well, but the cluster of large employers is what really may have depended on a high-quality and high-capacity transit link with downtown to get their employees to work. There was already a bus line to South Lake Union, but streetcars are able to hold more people (mostly because they have fewer seats) and I’m willing to buy that Amazon and biotech employees might have a touch of rail bias. It seems to me that South Lake Union may be a more compelling guide for what the Central Loop could accomplish in the Central Eastside, as opposed to looking at the Pearl District. The Central Loop and Seattle Streetcar have many similarities, after all. When Seattle Streetcar started, it was derided as a streetcar to nowhere, and lack of operational funding has led to disappointing frequency for such a short transit line. The Central Loop is somewhat similar–while it doesn’t really go “nowhere,” it does spend much of its time in the Central Eastside along sparsely developed parcels and running on a high-speed, traffic-heavy highway. Not only that, but it takes the most circuitous possible route between downtown and Central Eastside, duplicates a couple bus lines (the 6 and 17) for some segments, and there are many more direct bus alternatives across the river. Frequency is especially disappointing–due to a lack of funding and delays in new vehicle production, we will be stuck with 18-minute frequency for awhile, and probably can only hope for 15-minute frequency in the near future. However, with all these similarities, Seattle Streetcar may represent a glimmer of hope for the Central Loop. If Portland can put its energy into attracting some major employers to develop new headquarters and operations on the Central Eastside along Grand and MLK, we can probably expect higher ridership on the streetcar and eventually, hopefully, we will get our own Amazon that is willing to pay for better service that we can all benefit from. My worry with the Central Eastside is that the city will just assume the streetcar will do all the work, without doing all the other things needed to create a new commercial district. This effort will require more upzoning (we should be allowing skyscrapers, not the piddly 5 to 8 story buildings allowed under current zoning), an expansion of developable area (currently limited to the blocks immediately adjacent to MLK and Grand), major parking reform (metered parking, parking management, parking limits, etc), more signals and better pedestrian crossings, and more development incentives. We should also work toward getting an exclusive lane for the streetcar in the future. 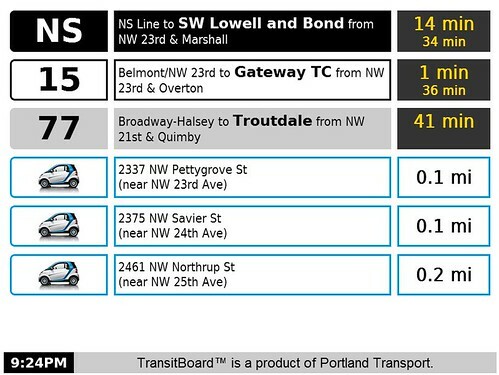 Most highways in Portland are 4 or 6 lanes wide, so why does 99E through the Central Eastside need 8 lanes? In general, the point is that this should be an aggressive effort to expand downtown across the river, not a modest attempt to get a few mixed-use apartment buildings built right along the streetcar. We need to focus on major employment right along the line, perhaps with some mix of affordable housing and smaller businesses on the outlying parcels. If we don’t get this right, we are going to be stuck with a shiny new streetcar line (the most expensive ever built, in fact) that runs infrequently and carries few passengers. Yonah Freemark at the Transport Politic recently wrote an article on this very subject. I agree with the general sentiment of the article, although I think he is off the mark in assuming that the current zoning here is adequate, or that Portland is making enough of an effort to really attract development to the Central Eastside. He even acknowledges that our streetcar is “absurdly slow,” yet still assumes it will have some kind of dramatic impact on development. If we see major redevelopment in the area, it will be because of an increase in zoned FAR, development incentives, major investments in streetscape and traffic improvements beyond just a mixed-traffic streetcar, and increased bus service across the river. One response to my call for major employment to be the focus may be that we need to nurture the small, artisan industries sprouting up on the Central Eastside. That is entirely appropriate, and it makes sense to keep certain areas protected for light industrial use. Everything west of 3rd Ave, for example, makes sense as light industrial since it has the UP rail line and is stuck underneath viaducts and the freeway. The area south of Hawthorne also makes sense, since it is outside the core of the area. However, we should recognize that much of the Central Eastside is underutilized and car-oriented, filled with empty buildings, vacant lots, drive-through fast food restaurants, auto shops, and parking. We should also recognize that if we spent $100 million to build a streetcar line to promote redevelopment, we can’t also say that existing uses have to be wholly protected. There is a larger question here of what we think the highest and best use of prime central city land should be. The area from 6th to 12th contains many fine businesses, but preserving it as low-density industrial when there is so much redevelopment potential in that area is a waste. Keeping it industrial condemns the Grand/MLK corridor to feeling like a small, isolated swath of urbanity rather than a cohesive part of the rest of inner SE. Take a walk from Stark &12th to Stark & Grand and you will see how disconnected the neighborhoods feel and how unpleasant it is to travel by foot. We should seize this opportunity to connect our residential neighborhoods to the river. There is also a question of balance between small and large businesses. Many Portlanders I talk to are very proud of how we nurture and support small businesses and start-ups, but it seems like few people in this city recognize the value that large companies can bring. They obviously help to form a solid economic foundation in terms of jobs and income (after all, those small businesses need customers with disposable income), but what people often forget about are the direct public benefits like the Amazon deal. Large employers have a major stake in the city and can actually see direct financial benefit to making investments in the city in terms of attracting a quality workforce. They not only make transportation and land use investments and pay taxes, they also tend to be philanthropic, sponsoring city events and projects. I for one hope that Portland can use the Central Loop as an opportunity to attract some similarly deep-pocketed company that can be a partner in making this city a better place. Lest this get lost in the hoopla surrounding the opening of the Streetcar Loop, please note that the Oregon Iron Works/United Streetcar prototype vehicle is now certified for revenue service and in operation on the streets of Portland! For those who have forgotten the history of this vehicle, it was procured with a grant from the Federal Transit Administration to jump start manufacturing in this country, and then a further grant was obtained to replace the Skoda propulsion system with a made-in-USA Rockwell system. Enjoy riding it! Portland now has an 11-car fleet, which will expand rapidly as more United Streetcar vehicles arrive this fall.